George W. Bush and slavery: The president and his father are descendants of Thomas Walker, a notorious slave trader. A surprising new discovery about the notorious Thomas “Beau” Walker. BUNCE ISLAND, Sierra Leone—Twelve American presidents owned slaves, eight while serving in office, and at least 25 presidents count slave owners among their ancestors. But new historical evidence shows that a direct ancestor of George W. and George H.W. Bush was part of a much more appalling group: Thomas Walker was a notorious slave trader active in the late 18th century along the coast of West Africa. Walker, George H.W. Bush’s great-great-great grandfather, was the captain of, master of, or investor in at least 11 slaving voyages to West Africa between 1784 and 1792. Scores of European merchants and American plantation owners grew rich on the trade that transported more than 10 million Africans to North America, the Caribbean, and Brazil between 1550 and 1850. Bush’s family, like many others, has previously been identified as slave owners in the United States. In the late 18th and early 19th centuries, at least five Walker family households, George W. Bush’s ancestors by his father’s mother, owned slaves in Maryland’s Cecil County. The discovery of the slave-trading ancestor of the Presidents Bush was made by two men: Roger Hughes, a retired newspaper editor and genealogist in Illinois who has previously documented other Bush ancestors as slave owners in the United States, and Joseph Opala, an American historian who has spent much of his adult life in Sierra Leone, the former British colony on the West African coast. Opala heads a project to preserve Bunce Island, a slave fort 20 miles upriver from Sierra Leone’s coastal capital, Freetown, where Thomas Walker bought Africans in the late 18th century. On Bunce Island thick jungle hems in the hulking ruins of the slave fort, abandoned after Britain banned the slave trade in 1807 and left largely untouched since then. Gravestones record the names of long-dead slavers. As Hughes conducted genealogical research into Bush’s ancestors, he began to suspect that two Thomas Walkers in the historical record—one a British-born merchant and known ancestor of the Bushes, the other a slave ship captain who journeyed to Bunce Island—might be the same man. The known Bush ancestor married in 1785 at Bristol, which along with London and Liverpool was one of the three British cities highly involved in the Atlantic slave trade. He later emigrated to the United States, applying for naturalization at New York in 1792, which he received two years later, and purchasing property at Burlington, N.J., in 1795. At Opala’s recommendation Hughes sent scans of the two Walkers’ signatures to Maija Jansson, a handwriting analyst at Yale University, without any information on their provenance. Jansson confirmed that the signatures were from the same individual. “The decorative loop under the signature is a key and is virtually the same in the letters,” she said. A series of documents comparing the signatures of Thomas Walker. Click to view larger. Hughes said he was convinced, based on the historical evidence, that Bush’s forebear Walker was the same man as the known slave trader. “If I had to testify to this, I’d say this is the same guy. The Bush family’s spokesman in Houston, Jim McGrath, had no comment on the findings. The George W. Bush Presidential Center in Dallas did not respond to multiple requests for comment, nor did Jeb Bush spokeswoman Jaryn Emhof. The signatures of Thomas Walker, the known Bush ancestor, come from documents recording his marriage to Catherine McLelland in February 1785 in Bristol. They are preserved in the Bristol Record Office. The signatures of the known slave dealer Walker were drawn from two letters dated June 23 and July 2, 1787, the first written at Bunce Island and the second at the Banana Islands, which lie off the Sierra Leone coast. These letters are preserved in the British National Archives at Kew. The Thomas Walker who married Catherine McLelland is identified as Bush’s ancestor in Gary Boyd Roberts’ Ancestors of American Presidents, published by the New England Historic Genealogical Society. 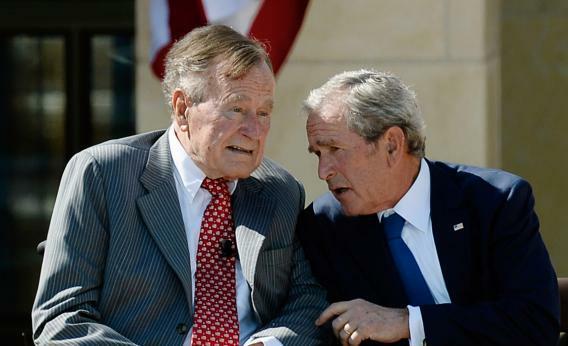 Former President George W. Bush talks to his father, President George H.W. Bush, during the opening ceremony of the George W. Bush Presidential Center on April 25, 2013, in Dallas. Roberts said that while he had not known of Walker’s slave dealing, the finding did not surprise him, given that the Walkers were a mercantile family and Baltimore, where they established themselves in the United States, was a hub for the slave trade. “It would strike me as being perfectly logical and perfectly expectable,” he told Slate. The historical evidence suggests that Thomas Walker died at sea in 1797 when his own crew mutinied and threw him overboard. Documents in the British House of Lords Sessional Papers indicate Thomas Walker is the same man as a “Beau Walker,” whose unpleasant end is in turn recorded in the journal of Zachary Macaulay, a British anti-slavery activist, sometime governor of Sierra Leone and father of the celebrated Whig historian Thomas Macaulay. Thomas Walker and Catherine McLelland had three children, Rosetta, Thomas, and George, born between 1785 and 1797. Their younger son, George’s, descendants include the Presidents Bush. After Thomas Walker’s death, Catherine moved with the three children from Burlington, N.J., to Philadelphia, where in May 1801 she remarried to a man called Robert Hodgson. While records are scarce, it seems that Thomas Walker’s slave trading did not bestow lasting prosperity on his family. George E. Walker lost property in Maryland’s Cecil County inherited by his wife, Harriet, and the subsequent rise of the Walker family began several decades later, after they moved to Illinois in 1838. While Bush’s distant ancestors may have been involved in exploiting African slaves, his own presidency won praise from many poverty campaigners for its work on the continent. Bush backed debt forgiveness for 21 African states, and his President’s Emergency Plan for Aids Relief (PEPFAR) pumped billions of dollars into antiretroviral drugs for HIV/AIDS sufferers, saving millions of lives in Africa.